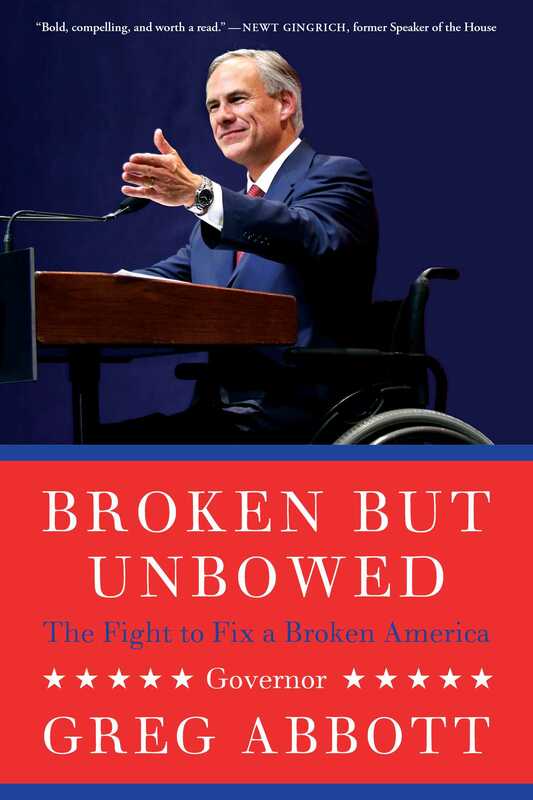 From Governor Greg Abbott—Texas governor and rising star in the Republican Party and one of the first prominent politicians to govern from a wheelchair—comes this deeply personal and inspiring life story and a plan to restore America to greatness in what Newt Gingrich calls a “bold and compelling” read. Greg Abbott lost his ability to walk when a huge oak tree crashed down on his back, fracturing vertebrae into his spinal cord, leaving him forever paralyzed. At twenty-six years old, he felt that the future he had dreamed of was gone. But he soon realized that our lives are not defined by our challenges, but by how we respond to them. He went on to overcome his paralytic limitations to become the longest-serving attorney general in Texas history and now governor, all while in a wheelchair. Greg Abbott waged a record number of legal challenges against the federal government that has come unhinged from the Constitution. He also led legal battles to defend the Second Amendment, the Tenth Amendment, and religious liberty. He personally appeared before the U.S. Supreme Court to defend the Ten Commandments monument on the Texas Capitol Grounds—and won. Through these fights he realized that his personal story held an important parallel to America’s current challenges. The Constitution that forms the foundation of our country has been broken, but the people of this nation remain determined to achieve American greatness. Abbott explains that it is up to us to restore America to its rightful luster and power in the world, emerging triumphant from our stumbles. In Broken but Unbowed, Governor Abbott describes firsthand what it was like to be on the frontlines of the historic fights that have refined the Constitution and the lessons he’s learned along the way, offering solutions that will bring us back a government that lives up to the American Dream. Our lives are not defined by our challenges, but by how we respond to those challenges. I’ve been known to get a bit emotional during graduation ceremonies. The feelings of past accomplishment and future hope are rarely experienced in the same moment. I remember my wife, Cecilia’s three college graduations, celebrating the bachelor’s and two master’s degrees she earned. I watched her overcome so many challenges and experience so much joy on her journey to becoming a teacher, a high school principal, and the first Hispanic first lady in Texas history. Then there’s our daughter, Audrey’s high school graduation. Just thinking about that day can make my eyes water—a bittersweet mixture of pride and sadness as she stepped into another season of life. She has always been a reminder of the joy that only a child can bring. The first thing I see when entering my office is a huge picture of our daughter when she was four years old. I’m holding her in one arm and she is beaming a big, radiant smile. That picture is a daily reminder of why I go to work. I want every child to smile, to hope, to dream, and to succeed. I’ve had the honor of speaking at high school and college graduation ceremonies across my state. These opportunities allow me to remind new generations that as they embark on the next chapter of their lives, they can overcome any obstacles that may come their way. There’s another reason graduations mean so much to me. The last picture of me walking was taken at my last graduation. In May 1984, with a mix of exhaustion and excitement, I walked across the platform to receive my diploma from Vanderbilt University Law School in Nashville, Tennessee. Three years before getting my law degree from Vanderbilt, I graduated from the University of Texas with a degree in finance. A few months later, Cecilia and I were married. Instead of a honeymoon, we packed and moved into the next chapter of our lives, when I began three years of intense law school study. In my final year at Vanderbilt, I secured a job at a prestigious law firm in downtown Houston named Butler & Binion. This position was exactly what Cecilia and I were aiming for as a young couple. The future we had dreamed of was on the brink of becoming a reality. We packed our bags in Nashville and headed to Houston, where we found a small apartment complex that attracted many other young professionals embarking on their careers. Our new home was on Allen Parkway, just a short drive to downtown Houston, where the offices of Butler & Binion were located in the city’s second-largest skyscraper. Since my new job didn’t officially start until September, Cecilia found a job at a nearby retailer, Frost Brothers. The upscale clothing store was just seven blocks from our apartment, so she’d often drive home for lunch. Although I graduated from law school, I had not yet taken the next step in a young lawyer’s journey: the state bar exam. Fortunately, a law school classmate of mine, Fred Frost, had also moved to Houston to begin work at another large law firm. He needed a place to stay until after the bar exam, and we both needed a study partner. Cecilia and I now had new jobs, in a new city, in a new apartment—and a new roommate! Before newly minted law grads can become lawyers, they have to pass the bar exam. Even after years of school, and landing a job, all my professional dreams hinged on passing this three-day test, which is held only twice per year, in late July and February. Pass the exam and you’re licensed to practice law. Fail the exam and you’ll have to study until next year’s test. And hope you still have a job. Because the stakes are so high, people often enroll in bar review courses; mine began in June. From the day Cecilia and I arrived in Houston, my new full-time job, if you will, was to dedicate myself to this course, and pass the bar exam. Fred and I had classes in the evening and studied during the day. Sometimes we studied together, coaching each other, and sometimes alone. But we often took an afternoon break to exercise. I was a competitive runner in high school and kept at it through my college years. For me, running was a refreshing break from sitting at a desk. Although Butler & Binion was a relatively large law firm, it wasn’t stuffy. Its trademark was the firm’s family-style friendliness, from junior staff all the way to the managing partner. The firm hosted entertaining events during the summer to woo law students who would become the next class of lawyers for the firm. The big event each summer was a formal dinner at the Houston Country Club. Tuxedos, gowns, music, and dancing were all a part of this traditional summer dinner. For a couple of twenty-somethings fresh out of college, this was quite a splashy affair, and definitely not what we were accustomed to. We were concerned about paying the rent, settling into a new city, waiting for health insurance to begin, and all the other challenges young couples have when they start their professional lives. We were grown-ups, but this formal event made us feel like kids. I remember dancing with Cecilia, smiling and marveling at how wonderfully this new chapter of life was unfolding. It seemed we’d stumbled onto a movie set—a film with a jubilant ending. This was the beginning of the life we’d been striving for, and a tangible step toward the vision we shared. It was a magical night. The next morning, I kissed my wife goodbye as she went off to work. Even though it was Saturday, I went to work, too, at my desk—the same one I used throughout my entire law school career. On my desk, beside the stacks of books and papers, were airline tickets we’d purchased for a trip to London. Traveling to London—or some other overseas location—after the bar exam was a tradition in some circles. New law grads often take a month off after the July bar exam, since results aren’t received until November and it may be the last opportunity to take that much time off until their careers are concluded, far in the future. With my job beginning in September, the timing was perfect. After years of grueling study, Cecilia and I were also looking forward to this trip as the honeymoon we never had. Our wedding was just two weeks before I began law school. We spent our “honeymoon” packing and moving and readying for the rigors of law school. London would be a vacation—and honeymoon—worth the wait. And if that wasn’t enough, in two weeks, after completing the bar exam, I’d be free from tests forever. Or so I thought. This interruption was no shock to Fred, who was studying in his room. We often took a running break. A few minutes later, we were out running on well-kept sidewalks that sliced through manicured lawns of an upscale neighborhood, west of downtown Houston. From my days in Little League baseball to high school football, and an undefeated regular season in track, I had always loved to run. The challenge of running, and the physical exertion, always gave me a renewed vigor. Whether it was athletics, mowing lawns in the summer, or hauling steel in a forge factory, I’d always felt a physical, mental, and emotional renewal from hard work. Believe me, running in the July heat in Houston was hard work. It was a typical muggy afternoon, but windy and overcast. Fred and I headed down the sidewalk at a brisk pace. The burden of my studies began to fall off my shoulders with every stride. We usually ran side by side, trading good-natured verbal jabs along the way. But whenever the route wasn’t wide enough, I found myself sprinting ahead. About ten minutes into our run, I noticed the sidewalk ahead was about to narrow. I moved in front of Fred. The first shock was the sound—a loud explosion that sounded like a bomb had exploded about ten feet away. Reflexively, I turned my head to the right, where the sound originated. It was a tree. A big oak, well over fifty feet tall, with a trunk two or three feet wide—and an enormous crack at the base. And the tree was falling exactly where I was running. Think of the sense of panic you feel when you perceive imminent danger. That sudden sinking feeling in your stomach when your heart abruptly stops, then races rapidly. That moment of fright that makes your hair stand on end. Then multiply it times a hundred. That’s what I felt. In a nanosecond, thoughts raced through my head. If I stop or keep going straight, I’m gonna get clobbered, and I can’t go left because cars are parked there. Go right! The next thing I knew, I was down. Flat on my back. The entire catastrophe—from the time I heard the sound until I hit the ground—lasted no more than a second. The good news was that I was still conscious. The bad news was that I had not lost consciousness. The pain was immediate, excruciating, and unrelenting. I had broken bones in the past and had a concussion playing football. But this was altogether different. The pain was magnified by my inability to breathe. I’d had the wind knocked out of me before but this was beyond comparison. Trying to take in air ripped me with stabbing pains. Any attempt to exhale was sheer torture. All I could muster were short, shallow gasps. I didn’t know what had happened, but I could tell it was bad. Everyone who suffers a serious injury goes through some instant stages. First there is the immediate shock to the body. Then, instinctively, the body and mind transition into survival mode. One second I was running. The next second, all I could think about was what I could do to survive. Fred took a look at me and said he would run to a house and call an ambulance. These were the days before cell phones. I was afraid to move because I had no idea what damage had been done to my body. So I just stayed motionless on the ground, faceup, waiting for what seemed like decades for the ambulance to arrive. But I had little choice. Any attempt to move punished me with even more pain. As I waited and waited, lying flat on my back, I felt a weird sensation that my legs were frozen in midair, in the position of a runner’s stride, but unable to move. It was as if rigor mortis had frozen my legs the moment the tree hit me. Then the sickening thought struck me, that maybe I was paralyzed, with my legs stuck in the running position. Slowly, excruciatingly, without raising my head to look, I reached with my right hand to feel my legs in the air. But they weren’t there—or weren’t where they seemed to be. I kept feeling for them and finally realized they were on the ground. I could feel my right leg with my hand. But my leg didn’t feel my touch. This, I realized, must be paralysis. My injury could be really bad. At that moment, I perceived my life had forever changed. Even the tormenting pain seemed to be eclipsed by a sudden sense of doubt and uncertainty. Once again, thoughts raced through my head. I remembered watching a movie with my wife a year earlier about a man who had been paralyzed by an accident. At the time, I told my wife that if that ever happened to me, just put me to death. I wondered what was going to happen to me. Would I be able to walk? Would I be able to work? Would I be able to remain married? How would I be able to take care of my wife? What in the world was going to happen to my life? When the ambulance finally arrived, the technicians assessed the situation and brought out “the board.” It’s the wooden board you sometimes see accident victims or injured athletes strapped to. When you see the board you know the situation is grave. I did, too. The emergency medical team used care in slipping the board under me, but it didn’t make things any less painful. When they slid the board under me it felt like it was made with shards of glass grabbing and clawing my body with each and every movement. As I was placed in the ambulance, Fred reassured me the best he could, and said that he’d get Cecilia and bring her to the hospital. You never really comprehend how jarring a pothole is until you’re riding in an ambulance, on a board, with vertebrae splinters piercing your spinal cord. Spinal cords are pure nerves. The feeling of a broken vertebra scratching against your spinal cord can only be described, and I apologize for the graphic illustration, as if dozens of needles were stuck into your eyes—every time we hit a pothole or turned a corner. GREG’S NOT OKAY, IS HE? As you can imagine, Cecilia vividly remembers every detail of that day. While at work, she noticed an afternoon storm and heard the sound of a lightning bolt a few blocks away. The lighting strike had knocked out power, and the store was completely dark. The manager locked the doors and wouldn’t let anyone in or out. “Where’s Greg?” she asked Fred as they walked outside. Confused, Cecilia agreed to follow Fred to the hospital in our car. On the way there, she began to think something might be seriously wrong. Yes, we’d discussed health insurance the previous week, but why would Fred stop by the store? Her fears grew as she entered the hospital and was escorted to the emergency room by Fred and two police officers. “Greg’s not okay, is he, Fred?” she whispered. A nurse led her to the emergency room, where I had been placed. Cecilia later recalled that moment and, despite seeing me on the hospital bed, her overwhelming emotion was joy. She was simply grateful to find me alive. The medical team at the Twelve Oaks emergency room used scissors to cut off my clothing and assess the damage to my body. The doctors said my back looked like it had been run over by a car. There was even a black and blue stripe across my back, the width of a car tire. They pelted Fred, Cecilia, and me with questions about what had happened, in their efforts to plan treatment. My breathing was getting even more torturous and labored, so communicating with Cecilia and the medical staff was difficult. I was incapable of completing sentences and could only gasp a word at a time. I was in such severe pain that the staff couldn’t communicate with me very well, either. Cecilia wasn’t getting information, presumably because they were trying to protect her. In fact, she didn’t fully understand the accident until she read about it in the newspaper the following morning. Even worse, the pain was increasing by the minute. It had gone beyond the initial shock to a penetrating pain that felt like a tidal wave had begun to overcome me and pull me away from the shore. It became a struggle just to hang on to consciousness—and life. I expected some type of emergency procedure. I anticipated that any minute I would be whisked into surgery, or at least have X-rays. I needed to know what was wrong, and I needed relief. Stat. But the doctors remained uncertain how to respond. They gave me some oral painkillers while they huddled, and while I waited. For hours. Houston is home to one of the world’s largest medical centers, the Texas Medical Center, which includes the highly acclaimed Hermann Hospital, which has a Level I trauma center and resources for major surgeries and spinal care. It is located just two miles from my accident site. For reasons that are still a mystery to me, the ambulance team had taken me to Twelve Oaks Hospital instead of Hermann Hospital. It turned out that my injuries were beyond the capabilities of what Twelve Oaks could treat. Twelve Oaks offered basic care but not the level of treatment I needed. Hours of precious time had been lost. The Twelve Oaks emergency team loaded me back on the dreaded board for another jarring ambulance ride, this time to Hermann Hospital, a mile away. There comes a time when the body is encapsulated in so much pain a person simply doesn’t care anymore. All you do is survive. I had reached that point. It was now about four hours after the accident. This whole time, I had several vertebrae in my lower back crushed into fragments and splintered into my spinal cord. Several ribs were broken and vital organs were damaged. Internal bleeding had begun. The Hermann Hospital emergency medical team immediately hustled me into an ER surgical room. This was 1984—prehistoric compared to today’s medical technology and knowledge. They didn’t have MRIs or other advanced devices available to see the extent of the internal damage in my back and abdomen. Barely alert, I was told that they needed to determine the extent of internal bleeding and where it was coming from—and they had no time to waste. They needed to immediately perform a diagnostic peritoneal lavage, a surgical procedure to determine if there was any blood in my abdomen. The medical staff didn’t know if I had ten minutes or ten hours left. They just needed to move fast. Their focus was solely on saving my life, not reducing my pain or establishing my comfort. I lay on a cold metal table in a chilled room filled with bright lights and a swift-moving medical team. A nurse came up and gently cupped my head into her hands as the team hurriedly plugged lines of blood and other fluids into different parts of my body. The nurse holding my head patted it and softly said, “Just turn your head, and let it out.” She knew I was about to vomit as an involuntary reaction. The surgeon then began slicing my skin below my navel at the same time they were beginning anesthesia. Finally, thankfully, I simply passed out. The next thing I remember was waking up in the intensive care unit, where I stayed for about ten days. I hoped the most difficult times were behind me. It turned out that the pain and the physical challenges were just beginning. Again, medicine at the time was not as advanced as it is now. I had to wait for several days, with bone fragments lodged in my spinal cord, because the surgeons could not operate until the swelling went down in my torso. The pain was incomprehensible. And hence I lay virtually motionless in the hospital bed, living from one morphine shot to the next. Life was distilled down to a fundamental focus: I simply needed to survive physically. There were times in the ICU when I didn’t know if I was going to survive. I was now living minute to minute. On one hand my dire circumstances were overwhelming. On the other hand, my life was surprisingly clear—everything outside my hospital room had no relevance whatsoever. All that mattered was that I survive another minute, one more minute. If I had the same accident today, I probably would have been out of the hospital and into a physical rehabilitation center in ten days. For me, in 1984, this hospital was my home for the next month and a half. I had plenty of time to think when the morphine allowed. And I had a new vocabulary word to ponder: paralysis. A neurosurgeon came to see Cecilia and me during my stay in the hospital. He was very nice but very frank. I was extremely upset, not only about the diagnosis, but also because of the clarity of the verdict. “Are you sure there’s nothing that can be done?” I pleaded. “Yes. I’m sure,” was the answer, every time. There was certainly a grieving process. I experienced every thought and emotion you can imagine, and many you can’t imagine. Sounds like a strange thing to say, doesn’t it? But on some level, I felt like I had been to hell and back. And I was still alive. There is an ironic liberation that comes with that experience. These were some of my more upbeat thoughts. The other reality for me was this: a life once filled with confidence was now suddenly riddled with self-doubt. I was the baseball player who knew, with absolute certainty, that if I could get on first base, there was no way the pitcher and catcher could stop me from getting to second base. I was the student who knew, through sheer hard work, I could pave a pathway to success. But that person was a fuzzy memory. At twenty-six years old, he was in a body cast, facing an uncertain future. I suddenly faced obstacles that made it more challenging, if not impossible, to achieve my goals. Not only that, but the prospect of doing simple, daily tasks seemed daunting. There were questions of all sizes bombarding my tired mind. How would I take care of myself? How would Cecilia cope? Could we have the child we dreamed about? Could I take care of my family financially? Could I even work? Worries came and went. Small victories were celebrated. After several surgeries and a prolonged stay in the hospital, I went to The Institute for Research and Rehabilitation. In the process of rehab at TIRR, I regained full use of my hands and arms. I found physical therapy to be just the challenge I needed. Finally, an opportunity to work out again! After about six weeks at TIRR, I was able to go home for a few months and begin the process of learning to live in a wheelchair. Cecilia and I were surprised to find the management of our apartment complex had converted our apartment and entryway, making it accessible by wheelchair. We were worried about our health insurance coverage but soon discovered we had some coverage through a policy we’d purchased the previous year in Nashville. This wouldn’t cover all the costs, but every bit helped—financially and emotionally. After learning about the accident, many people came to our aid with food, visits, prayers, and encouragement. They included my new colleagues at Butler & Binion. For those whose interaction with the legal community has been, let’s say, less than positive, you might think lawyers are a heartless bunch. They could have been thinking, If the new hire has a broken back and can’t come work, we have to find someone else for the position. Little did I know that the attorneys, who shared in that magical evening at the Houston County Club the night before my accident, were the people who had taken off work to find the best doctors for me. Even more, they were like family to Cecilia, helping her navigate not only my care, but everything she needed as a new resident of Houston. The waiting room was always full of family and our new friends from the law firm. I was one of about thirty-five new lawyers for the firm, so they could’ve done without me. But their lead lawyers and partners took time off to be at the hospital. While I was still in the hospital, the law firm put me on the payroll, even though they were probably as uncertain as I was about my ability to work again. This period of time is difficult to describe. In one sense, my world was forever changed in an instant. But I came to realize that I hadn’t changed. And, I began to think, my dreams didn’t have to change either. Before my accident, I had rarely been in contact with people with spinal cord injuries. But now, on a daily basis, I was interacting with others who experienced them, too. We were all paralyzed in one fashion or another. A primary concern of many if not most of those who faced this sudden shock was the goal of finding a way to walk again. They were going to devote their lives to being able to walk. I commend that attitude, which has led to countless medical advances, but I had other battles to fight. I was broken, externally, but not in my heart and mind. My legs were now wheels. The doctors told me that even if I could move my legs, I still could never walk. That was my reality in 1984. I had a choice. I could fight against that reality or I could begin devoting all my energy toward the future. To the surprise of many of my friends, I had no desire to seek experimental treatments that might restore movement or feeling in my legs. Instead, I decided to accept my circumstance and do as much as possible with it. I can’t fully explain this mindset. Part of this resolve might be the drive instilled in me from my youth by my parents. Part may be my God-given nature of being goal-oriented, hopeful, and practical. And part of the equation is certainly the grace of God—on me, and through Cecilia, family, friends, and so many wonderful medical professionals. I’ve gotten pretty good at popping wheelies, negotiating obstacles, and overcoming challenges in my wheelchair. It’s second nature now, just like a person walking up steps without thinking about all the intricate motions involved. Cecilia and I laugh about it now, but at the time, during one of my first returns to life in our apartment, I gave her quite a scare. One Sunday afternoon, while watching a Dallas Cowboys football game on TV in the living room, I got a little excited. I’ve always been a pretty expressive fan. One particular play had me so riled up that I threw popcorn at the TV. And I fell out of the wheelchair. It’s a good thing I was still wearing my body cast. When Cecilia came home, she gasped. I was quite a sight, I suppose, lying on the floor in front of the television, surrounded by a lot of popcorn. A normal occurrence in a new circumstance. Life was going to be different, but I didn’t have to change. Life was going to be good. 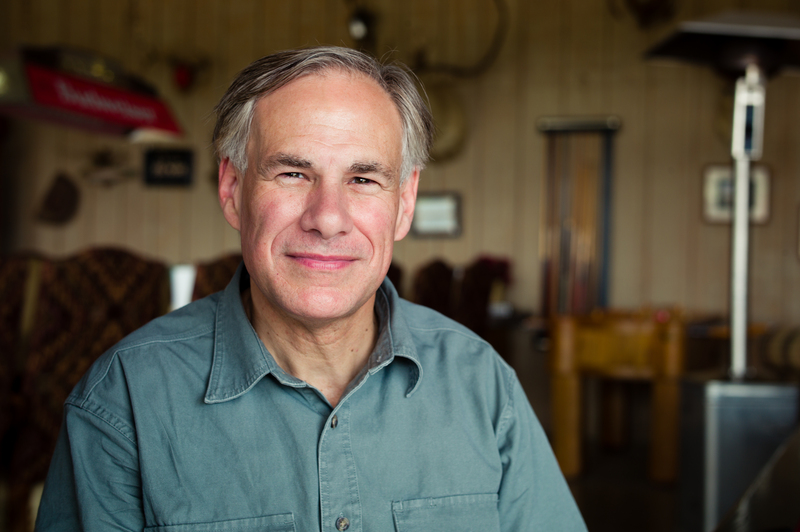 Governor Greg Abbott is a native Texan, born in Wichita Falls and raised in Duncanville. After graduating from the University of Texas with a B.B.A. in Finance, he received his law degree from Vanderbilt University. Shortly after graduating from law school, he was partly paralyzed when struck by a falling tree while jogging. Despite his life-changing accident, he went on to become a justice on the Texas Supreme Court, Texas attorney general, and now governor of Texas. Governor Abbott is an avid sportsman and hunter. He and his wife, Cecilia, have been married for thirty-four years. She is a former schoolteacher and principal and the first Hispanic First Lady of Texas. They live in Austin. Their daughter, Audrey, attends college.